Riding in the Maribyrnong River valley. This ride is one of Melbourne's unknown gems!! It goes from Keilor Plains to South Kensington and encompasses much of the Maribyrnong River. 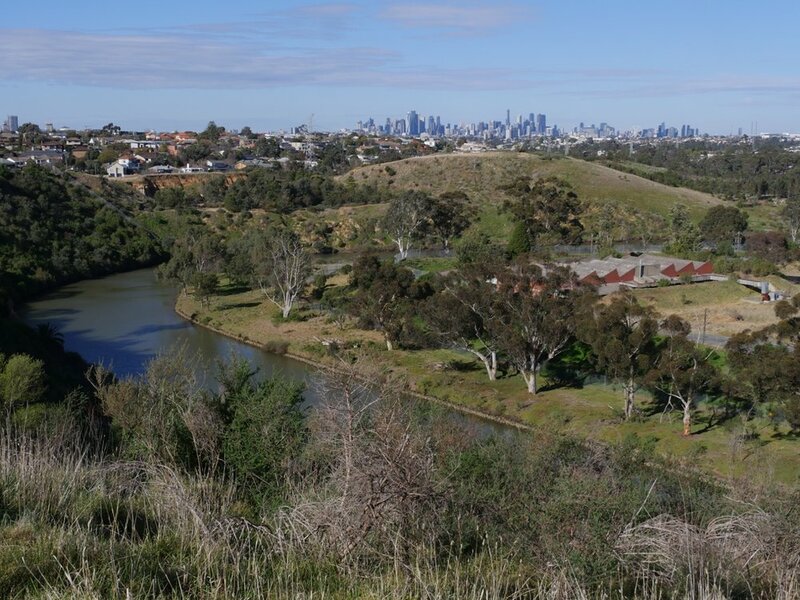 After riding along the back streets of St Albans for around 3km, you reach Brimbank Park. A steep descent to the Maribyrnong River leads to an old bluestone ford where you cross the river. The ride continues downstream on a gravel trail. For most of this section you are in a very deep river valley and the urban environment disappears with not a house in sight, just trees, bush and the sound of bellbirds, cockatoos and other birds. What is up the top of the very high embankment? Parks? Houses? Industry? It is impossible to know. The only signs of civilisation that you will pass are the Western Ring Road, high over your head, and a rail bridge, also high overhead. Eventually you reach Avondale Heights and Sunshine where you will start to see houses. At Essendon, you will find the only real uphill section of the route. Two very short steep hills and some more steady gentler hills get you up to the Lily Street lookout over Melbourne. What great views of the city! This would be a fantastic spot to see the fireworks on New Year's Eve. Now on a paved path, the ride goes steeply downhill and then along the river. The river has widened and flows serenely through landscaped parklands including Frog Hollow and Pipemakers Park. At one point you will ride across an island in the middle of the river. There are cafes near the river downstream from Essendon. There are a number of toilets along the route. The ride is fairly flat with some undulations except for one climb at Essendon. Start on the east side of Keilor Plains Station. Head directly east on Power Street to reach Sunshine Avenue. Turn right and then take the next left turn onto Bellara Crescent. At the bend in Bellara Crescent continue straight ahead leaving the road to ride along the path through Bellara Crescent Reserve playground. Turn left into Driscolls Road. When you reach Green Gully Road, turn right onto a shared bike path next to this road. Follow Green Gully Road (it should be on your left) to find a bike path leading steeply downhill into Brimbank Park. Ride downhill ignoring successive side paths on the left, the right and then the left again. Turn left at the next intersection to cross the river on an old bluestone ford. After crossing the river turn right onto Maribyrnong River Trail. After a short sealed section it becomes gravel. Follow this trail for 10 km to reach Essendon. You will pass under the Western Ring Road and a railway line. Then you will pass Solomons Ford and a foot bridge before using an underpass to go under Canning Street. Soon after Canning Street the path turns hard right. Turn right at the next intersection. The ride is about to become hilly. You will reach a T intersection at the historic tea gardens site, you can choose either turn left to the upper path or turn right to the lower path. The upper path will have good views. If you choose the lower path, you ride along the river and go uphill away from the river. Turn right at the next intersection. If you choose the upper path you will first wind uphill. Ignore a short path off to the left into the housing estate, then turn right and immediately left at the next intersection. The ride winds uphill via some switchbacks to the Lily Street lookout. After the lookout continue on the path downhill and along the river. Continue downstream along the river past Pipemakers Park, Frogs Hollow, and Burndap Park where you will be riding on an island in the middle of the river. Then pass under bridges at Farnsworth Avenue and Ballarat Road. Use the pedestrian bridge just after Ballarat Road (and just before the railway bridge) to cross the river. Follow Hobsons Road away from the river to Kensington Road. Turn left onto Kensington Road. Take the next street on the right, Altona Street. At the end of Altona Street turn right into Tennyson Street. The station will be in front of you. by adding on part of The Old Saleyards. The two rides meet at step 17 above.